We played this last month at Gigabites Café in Marietta GA. This game was based on the Robert Avery scenario Wave Goodbye, from the 2011 TFL Summer Special. 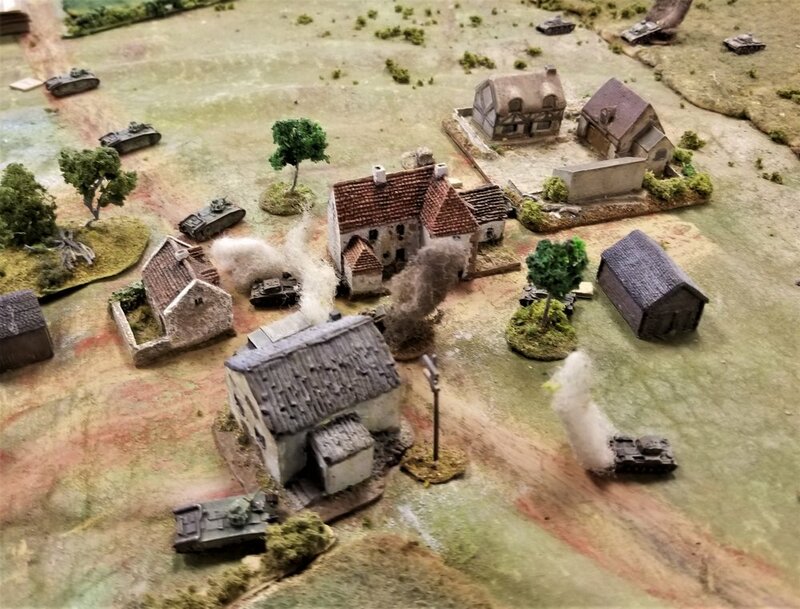 The idea is that a French armor counterattack is hitting the flank of a German panzer column in an area east of the Ardennes in May 1940. The Germans are heading down the road from left to right. They have elements of the 1st Grossdeutschland and 2nd Bttn, 8th Pz Rgt. Their column is temporarily halted to refuel. The tank CO's PZ IV A is out front at the head of the column. Followed by the 2nd Pz pla of 4) Pz IIICs, the 3rd Pz pla of 4 more PzIVAs, Then the infantry of 3 platoons (ea of 3- 8 men sec, 1 ATR team and a MMG section and their CO in 2 trucks). The halted 1st Pz pla (of 4 PZ IIBs) is refueling in the small village to the SW.
John handled the panzers and I was the infantry CO. The 1st Pz pla is in this group of buildings To activate they roll 1d6 per initiative dice and need a "6". William was the French player and he had a mixed group of armor and infantry from the 3rd Mot Inf and 3rd Arm Div. They would come on board in waves. The 1st wave had the CO in a H-39 tank and a Panhard AMD 178 and 3 more H-39s. 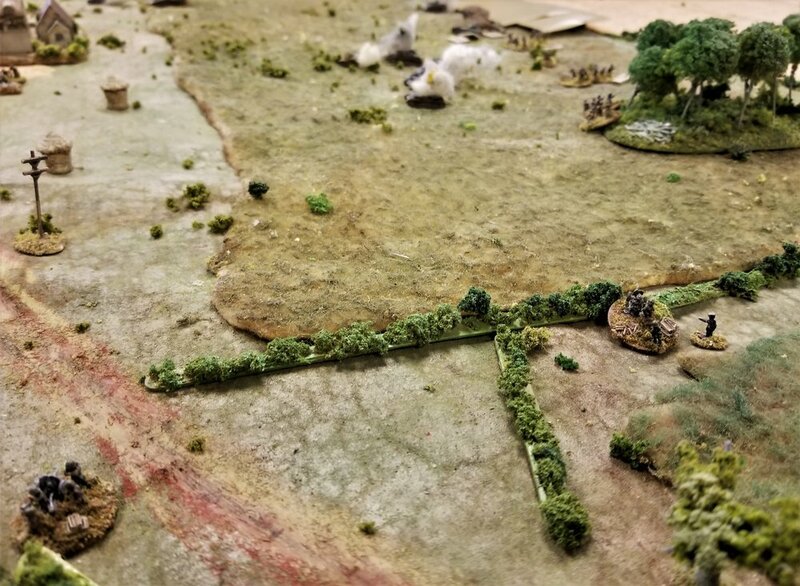 The 3rd wave was the infantry of 1 HQ sec, 2 - 3 sec platoons and 2 MMG teams. The problem is that each wave will not appear until the previous group has gotten wiped out. William did not know this and thought the Time card was the key to their appearance. 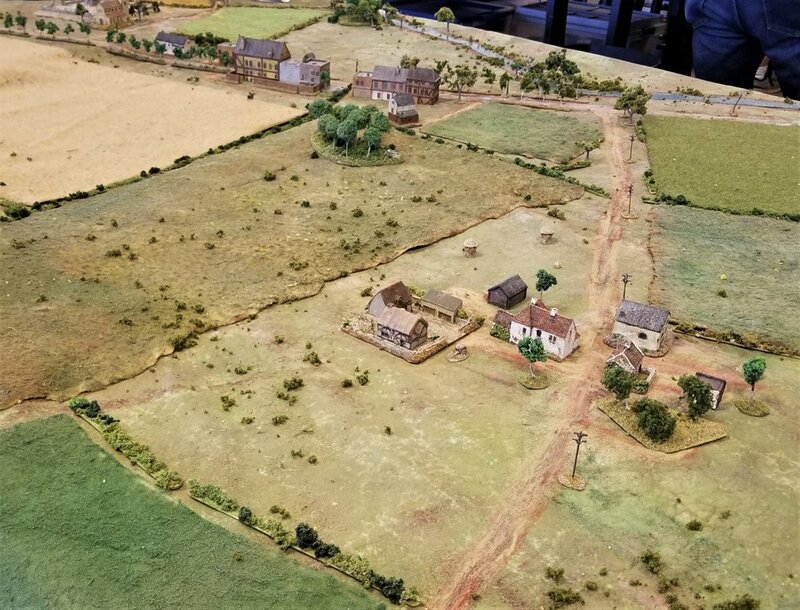 The AMD came in on the road and the Hotchkiss unit went left. William took the tanks off to the left to go around the buildings that had several German blinds. The armored car revealed most of them quickly. John also was in good shape with his Pz IIs at the very end of their refueling. William hit a couple of the Pz IIs with the A/C and the H-39s also scored a couple of hits. 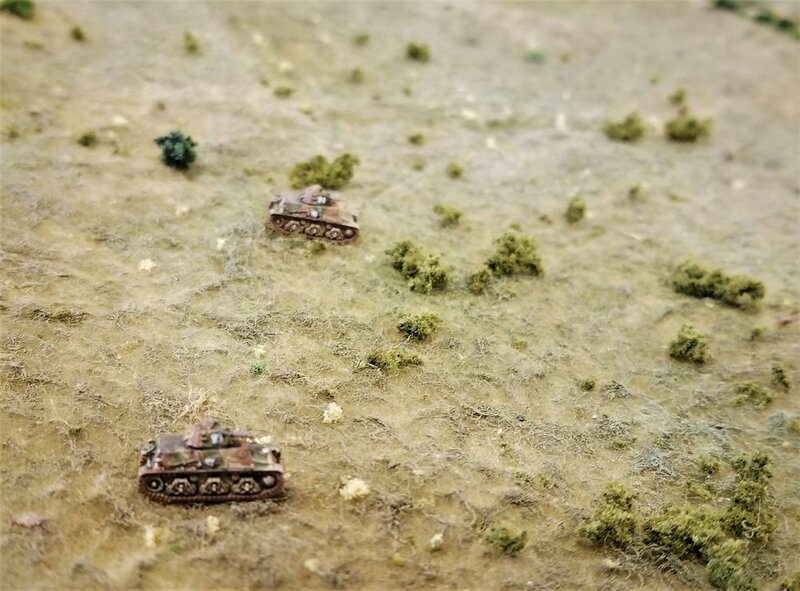 John's unit of Pz IVs spotted the Hotchkiss tanks and started moving and shooting from the opposite end of the table. Not much armor on these Pz IV versions. 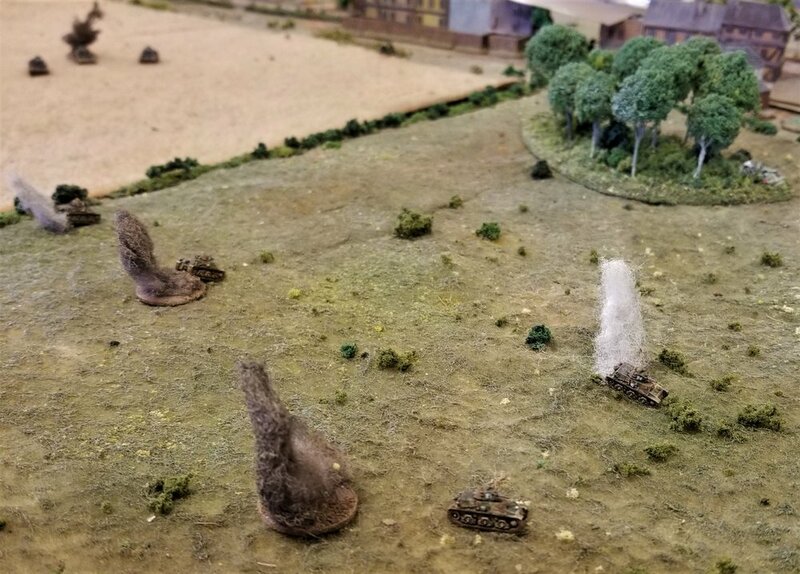 Their gun did give them some ability to take out a H-39 (Strike of 6 vs Armour of 5). But they were also considered slow tanks. It didn't take long for the H-39s to get disabled between the Pz IIs, and the Pz IIIs and IVs coming at them from the main road. But not for long. It did brew up the last H-39 that rushed into the hamlet. The A/C took that Pz out next. 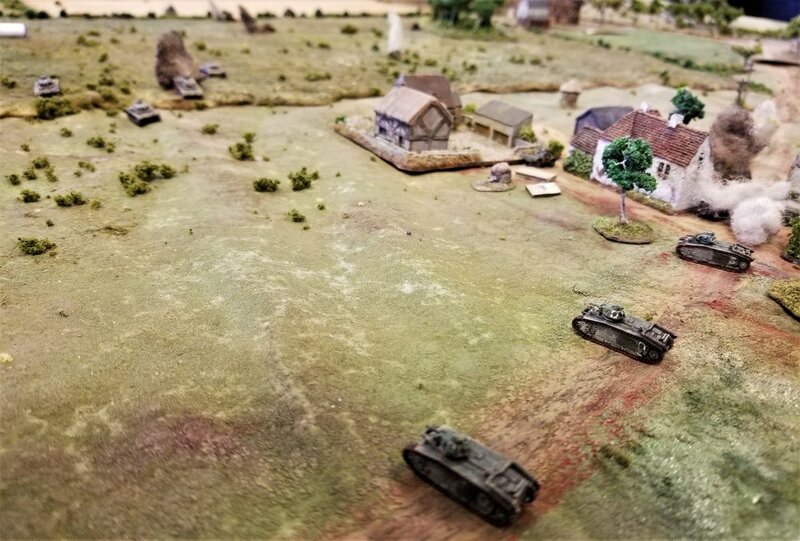 The 2nd Panzer platoon was heading directly at the Char B1 bis unit. But, alas, no matter how many Time cards appear, the infantry does not! There were still two Char B1 bis left but no German armor, so I decided that the infantry might as well come on. The Blinds to the right are a Pak 35 ATG and the Big Man for the Pak guns. 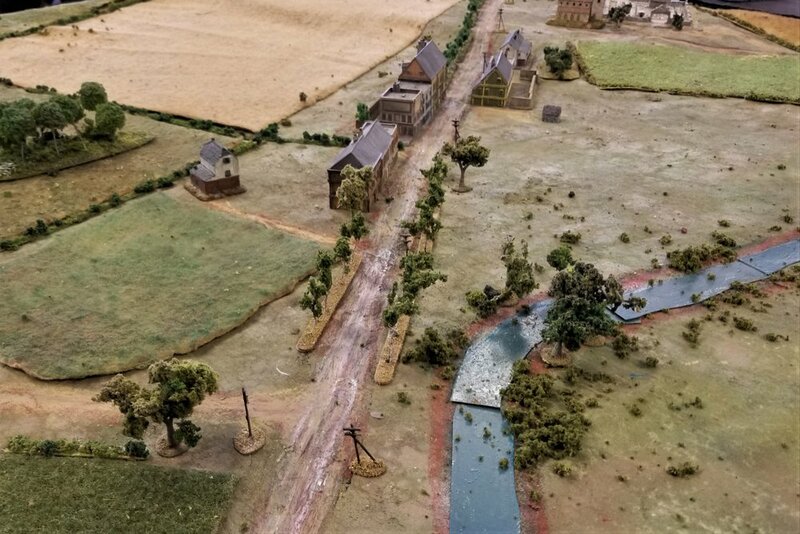 Which quickly drew the fire of the two French MMGs in the hamlet. No luck damaging the Char B1 bis with these guns. And the Paks also are being hit hard. There is one Pak left in the village. 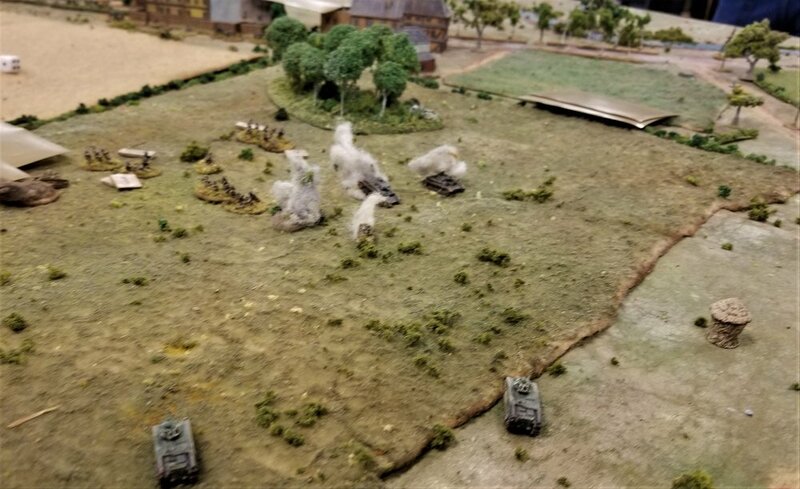 Victory conditions were for the Germans to have at least three vehicles left. But all panzers were gone leaving just nine softskins. Overall German casualties were just one grenadier down, two destroyed Pak teams, and four Pz IIs, four PzIIIs and five Pz IVs knocked out. The French lost fifteen infantry, one AMD a/c, four H-39s and two Char B-1 bis tanks. The French couldn't advance into the face of the Germans automatic weapons and the Germans had no more armor.